The other day I posted the Mom My Car video. Which Steve-O thought I should be shot for posting and Sarah G. wanted to know who'd been filming her car. 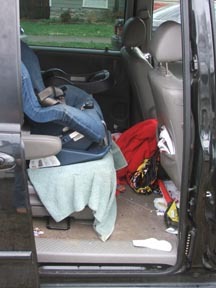 Sadly, she isn't the only one with a mom-mobile in a less than pristine condition. So in fairness, I thought I'd shoot a few shots of my van. Click on any of the pictures for notes of what the junk you are looking at actually is. 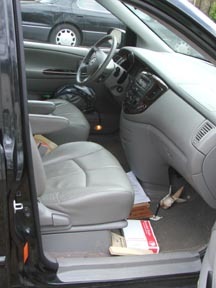 What you can't see, is the back seat, which is where my son stores his stick and rock collection, various drawings, books, and other detritus. Heh. If I'd known my sling would spend so much time on the crumb-crusted floorboard, I wouldn't have bought it in black. See, my problem is that now that the nest is empty, I still Mom my own ride. Huh. 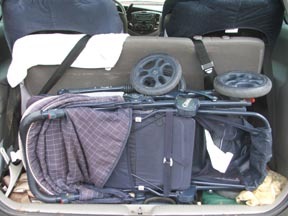 I loved my huge stroller, but it was a very happy day when I got rid of it. I feel better about our van now. Of course, we only have TWO little detritis distributors.